Join the fight against multiple sclerosis by donating here. The MS150 is a charity bicycle ride from Houston to Austin organized by the National Multiple Sclerosis Society. Similar events are organized by other MS associations in Canada and Australia. Bike MS/MS150 originated a single ride in 1980 in Minnesota. Today, according to the National MS Society, it is now the largest organized charity bicycling event series in the United States. 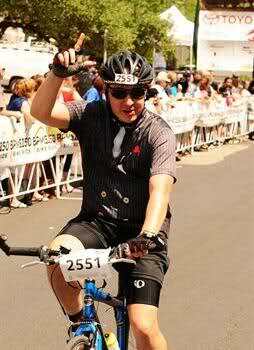 In 2011, more than 100,000 cyclists participated in 100 rides throughout the country, raising more than $77 million. The ride from Houston to Austin boasted 13,000+ riders and raised nearly $17 Million. In total, Bike MS cyclists have raised more than $600 million. The purpose of the rides is to raise money for multiple sclerosis research and other services supported by the National MS Society. The rides typically take place over the course of two days and are generally around 150 miles long. They can reach 250 miles spread over five days. Bike MS events aim to pull the community together by gathering support from local businesses, elected officials, residents and people living with MS.
Last year, we had a longtime friend, member, moderator, and collector pass away, leaving behind her husband and young daughter. She was a great member, a wonderful friend to many on many boards across the Internet and many sites such as Blogtv.com and Youtube. She was the type of collector that any online collector would have been lucky to deal with. Recently, a close friend was diagnosed. This is on top of the handful of people I know who already had MS. I will be riding again on their behalf, as well as in the memory of those I've lost. I signed up to ride in the MS150 last year to honor them and the many others that have been lost because of this horrible disease. It was an AMAZING experience so I am doing it again. It's going to be a tough ride, but it's nothing compared to what people dealing with MS deal with every day. I would really appreciate it if any of you could donate anything. $5, $10, $50, $100--whatever you can spare can make a difference in helping conquer this disease and help this amazing organization. Your donation could be matched, doubled or even tripled by your employer if you find them in the search at the bottom of the donation page. Donations are tax-deductible and are extremely appreciated! The donations do NOT go to me. They go straight to the NATIONAL MS SOCIETY via a secure website. Click here to visit the donation page. You can donate in your name, in someone's honor or anonymously. PLEASE donate whatever you can. Every bit is a HUGE help ! I just wanted to think anyone from this site that has donated… I am SOOO close to meeting my fundraising goal… PLEASE donate anything you can… even $5-10 is a huge help! THANKS SO MUCH !